One of the UK and Ireland’s first licenced helpers, a renowned training helper, a professional service dog handler, a trainer, teacher, mentor and lifelong advocate for the ‘whole’ German Shepherd Dog – both at National and International level and behind the scenes for many years. Alvin made many friends wherever he went, around the world, and truly lived and breathed our wonderful breed. We send condolences to Alvin’s family and friends, particularly to his wife, sons, daughter and grandchildren, his parents, brothers and sister and his nieces and nephews. We also remember his clubmates at OG Templepatrick, of which he was a founder member and lately Chairperson. 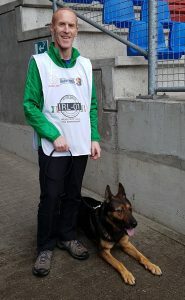 Although only in position on the GSA Ireland National Executive Council for a short time in the current tenure, he made a huge impact on the organisation and his legacy will be the continued improvement and harmonisation of the German Shepherd Dog in Ireland, in line with international standards. He was particularly proud of GSA Ireland’s standing and impact on the international German Shepherd Dog scene, despite representing a relatively small country in the dogsport world. We can only hope to keep aiming high and exceeding expectations, year on year, in his memory, promoting his maxim of ‘growth from within’. Picture shows Alvin with his beloved SG Obi wan Kenobi vom Wolfsblick, HD/ED normal, Kkl, IPO3, AD, WUSV-WM 2017 – all achieved under the auspices of GSA Ireland.